Aerosol particles are only to a small extent formed locally. The particle emission can be caused by dispersion of soil or biological material, by burning processes, or from the formation of aerosol particles from the gas phase by nucleation. Especially in the free troposphere, above the planetary boundary layer, no local aerosol sources are available. There, the particle population is dominated by long-range transport. To identify the sources of these free-tropospheric aerosol layers, TROPOS runs trajectory and/or particle transport models, which identify the origin of the air masses via model calculations. Lofted aerosol layers can preferably be detected with lidar. In the lidar measurement, the layers are visible as local maxima in the signal profiles. From the lidar measurement one thus obtains the time, place, and height of occurrence of an aerosol layer. To identify the source region of the detected aerosol layers and thus the aerosol type, the information on observation time, location, and height are used as input for a trajectory and or particle transport model. From meteorological data the trajectory and particle transport models calculate the path of the air mass before its arrival at the point of observation. Thus, conclusions on the source region of the observered air mass can be drawn. Fig. 1: HYSPLIT backward-trajectories ending at Leipzig on 27 May 2008, 21:00 UTC. Arrival heights of the three trajectories above Leipzig were 4200 m (red), 4600 m (blue), and 5200 m (green). 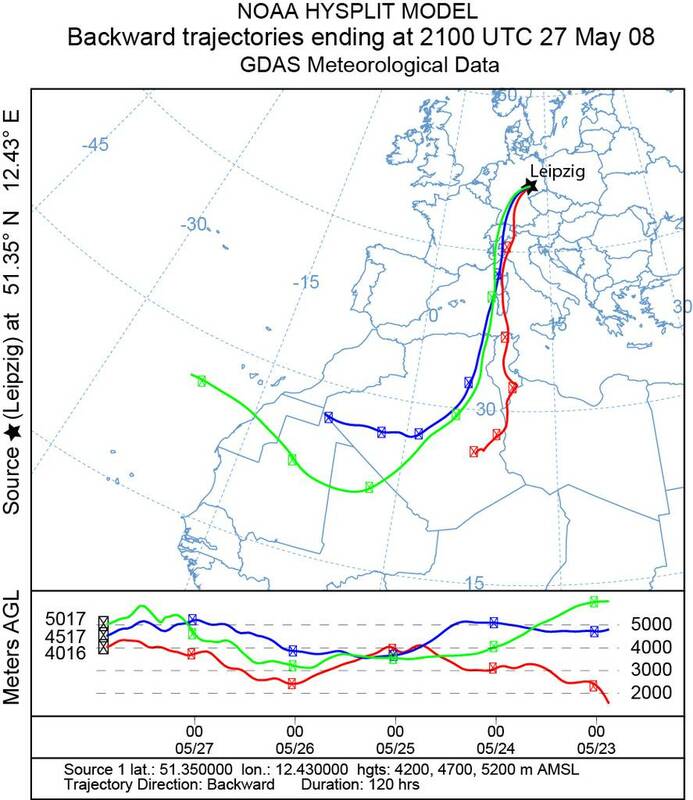 The trajectories point to the Saharan region as origin of the air mass. The most-frequently used trajectory model at TROPOS is the HYbrid Single-Particle Lagrangian Integrated Trajectory (HYSPLIT) Model of the U.S. National Center for Environmental Prediction (NOAA). For the input values start time, start location, and start height, either forward- or backward-trajectories are calculated. Whereas forward-trajectories provide a forecast of the pathway of an air parcel, backward-trajectories depict the path an air parcel has passed in the past. Figure 1 shows three backward-trajectories calculated with HYSPLIT for air parcels that arrived above Leipzig on 27 May 2008, 21:00 UTC. The arrival heights of the trajectories above Leipzig were 4200 m (red), 4600 m (blue) and 5200 m (green). The backward-trajectories show the pathway of the air mass during the past 120 hours. 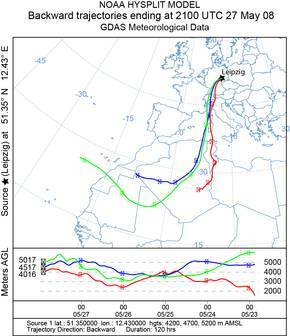 All trajectories point to the Saharan region as the origin of the airmass. Fig. 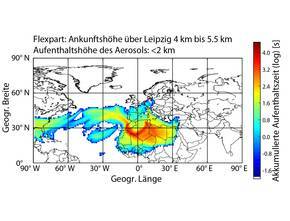 2: FLEXPART calculation for a particle population that was observed at heights between 4000 and 5500 m above Leipzig on 28 May 2008 at 21:00 UTC. The colored areas denote the spatial distribution of the particles from that height range that were present at heights below 2 km during the last 10 days before the day of observation above Leipzig. At TROPOS the public available Lagrangian particle transport model FLEXPART is installed on a Server to run autonomous particle transport calculations. For the model runs, archived data of the final analysis (FNL) of the Global Tropospheric Analyses of the National Centers for Environmental Prediction (NCEP) with a temporal resolution of 6 hours (00, 06, 12, 18 UTC) and a horizontal resolution of 1°x1° are used. In contrast to trajectory models that provide the path of a single air parcel, particle transport models provide the spatial distribution of the residence time of a particle population that was observed in a specific height range above a defined location. 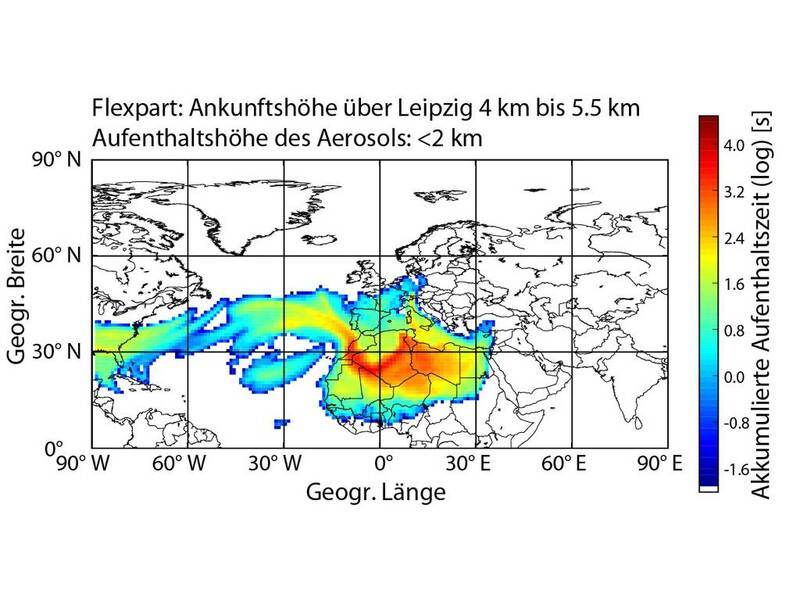 Figure 2 presents a FLEXPART calculation for a particle population that was observed at heights between 4000 and 5500 m above Leipzig on 28 May 2008 at 21:00 UTC. The colored areas denote the spatial distribution of the particles from that height range that were present at heights below 2 km during the last 10 days before the day of observation above Leipzig. Below 2 km height, it is very likely that the particles originate from the planetary boundary layer. Thus, regions where the particles spent a large residence time at these low heights are very likely also the source regions of the aerosol. From Figure 2 it is visible that the particles spent a large time period above the Saharan region. In addition, a small fraction stems from the Atlantic Ocean. Figure 3 shows a lidar measurement perfomed at TROPOS on 27 May 2008 from 20:23-21:30 UTC. 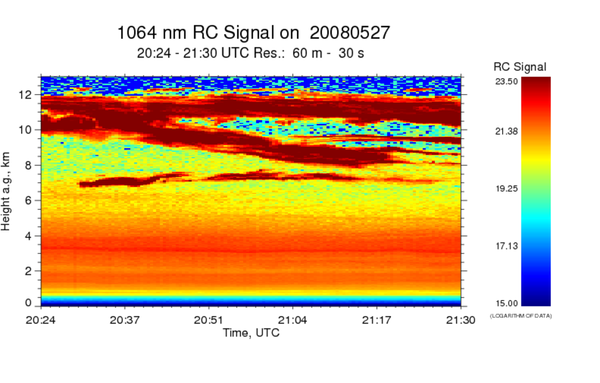 At heights between 7 and 12 km a cirrus cloud is visible, indicated by the strong (red colored) signal strength. Between the ground and approx. 6-km height, a very homogeneous aerosol layer (indicated by orange colors) is visible. For this measurement example the backward-trajectory calculation and the FLEXPART calculation shown in Figs. 1 and 2, respectively, were calculated. As explained before, both calculations depict the Saharan region as main origin of the observed air mass. Consequently, the observered aerosol particles are likely to be mineral dust particles. Lidar measurement perfomed at TROPOS on 27 May 2008 from 20:23-21:30 UTC. The measurement shows a cirrus cloud present between 7 and 12 km height and an aerosol layer that is present between the ground and approx. 6 km height.